The name is a mouthful, but the peach is a mouthful of flavor! Flamin’Fury PF 24C-Cold Hardy is gaining a reputation as one of the best cold hardy peaches that can be grown in challenging areas. One of Grandpa’s best friends is the famous peach breeder in Michigan, Paul Friday. Many years ago Paul asked Grandpa to accompanying him to view some of his first peach crosses. Paul was really excited about an early ripening peach that was ripening close to Independence Day. This peach was one of Paul’s first selections (PF-1). Over the years, Paul has made thousands of crosses and discovered many excellent peach varieties which he has patented and introduced as Flamin’Fury® peaches. Certainly, one of the most promising ones is PF 24C-Cold Hardy. Fruit growers, both professional and hobbyist, in Hardiness Zones 4 or colder have extremely limited choices in growing stone fruits like peaches and plums. Most just don’t have the hardiness to survive winters where it may hit 20 below on a regular basis. Even older, proven hardy peach varieties like Reliance and Veteran can’t really compare to the great flavorful peaches found in the produce aisle now. People in climates where late frost often “harvests” their crops in the spring have trouble growing peaches consistently. Often their choices were Madison, Contender, and a few other varieties that either bloom later or have so much bloom, that by sheer numbers some of them survive. Paul Friday discovered PF24C-Cold Hardy back in the 1990’s when hard winter freezes destroyed most of the peach crop in Michigan. He noticed one of his progeny still had a big crop that needed to be thinned hard, when other varieties had little or no fruit. In subsequent years, he also noticed that PF24C-Cold Hardy seemed to bloom later than almost all other varieties and consistently produced excellent crops in frostier sites where peaches actually shouldn’t have been planted. Over the years PF24C-Cold Hardy has been planted in many challenging locations across the country and great reports have been coming back about it surviving both late frost and hard winters that can drop as low as 22 below zero. While it can take years to truly determine the hardiness zone rating of a particular variety, it seems that PF24C-Cold Hardy may likely be a Zone 4 peach on the hardiness order of Reliance or Veteran, but with far superior qualities. PF24C-Cold Hardy ripens about 3 weeks after Redhaven starts picking. In Michigan this is about the third week of August. Grandpa has eaten many of the fruits and can tell you that it is an excellent peach— juicy, very flavorful and excellent quality. 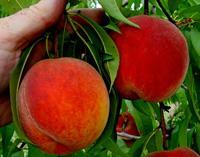 It is freestone and compares well to any other peach in its season. The tree is hardy and healthy. The quality of PF24C-Cold Hardy is so good that commercial growers are planting it for commercial markets. No one plants Reliance or Veteran anymore on a commercial basis. So, if you are wishing to try growing peaches where you shouldn’t, then PF24C-Cold Hardy is one of the most promising varieties that you should take a look at. While time will prove the merits of PF 24C-Cold Hardy, Grandpa thinks it will likely become the new “gold standard” for hardy peach varieties. I planted one of your Flamin Fury PF 24-C peach trees about 4 years ago. It has survived winters of 22 degrees below. This year it produced a nice bunch of peaches. Boy were they tasty! I canned a bunch, but ate many fresh. Such nice large red juicy peaches. I love this tree! Hello: Sorry, we are sold out of the PF24 for this season. Please check back, thanks!